With the advent of the Internet of Things (IoT), we are now seeing farmers use more wireless technologies to increase the quality and efficiency of production to achieve higher yields. IoT has opened the door for engineers to develop smart farming solutions to meet the world’s growing food demands. IoT will compel the industry to rethink processes and require the deployment of new technologies (sensors, wireless networks, applications/platforms) to ingest the massive amount of agricultural data and identify the actionable data that will help farmers meet their goals. There is a broad variety of sensors/wireless sensor networks (aerial, ground-based, satellite) currently in the market, and each one serves a unique purpose (e.g., livestock monitoring, vehicle tracking, crop/soil monitoring). To know “what really works,” you first need to consider how the end user will be interfacing with them and what data/information the end user requires to solve the challenges that they will face. So let’s answer this question with the challenge and the end user at the forefront. 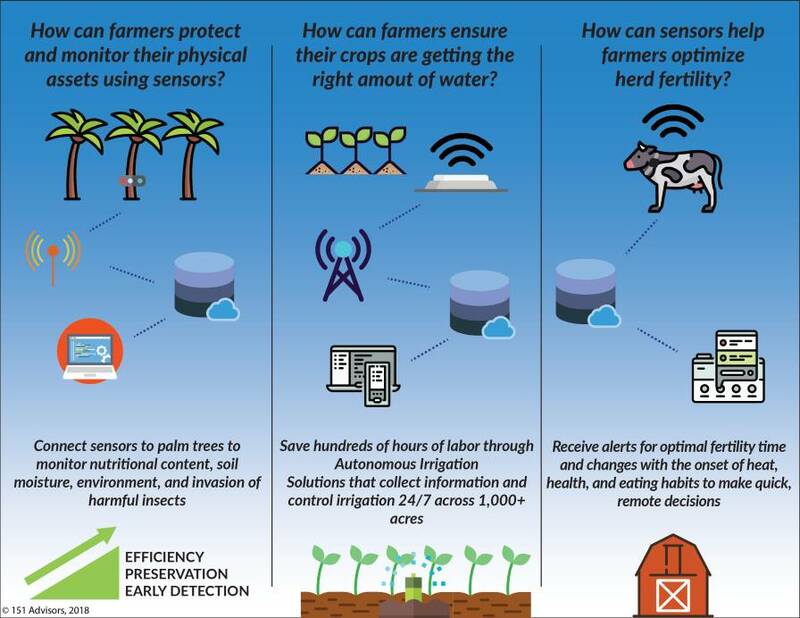 Sensor manufacturer Multitech offers a multitude of IoT connectivity options and equipment that allows farmers to connect physical assets to its business processes and monitor almost anything (soil moisture, animal location/activity, building temperature, humidity). Multitech’s partner, Agrint, developed a low-cost, low-energy, highly sensitive sensor that can detect the invasion of the red palm weevil in palm trees. This sensor has the ability to pick up on the subtle vibrations of larvae as it begins to tunnel through the tree, with an algorithm that analyzes data in specific patterns. Agrint selected Multitech as its IoT partner for its sensors, connectivity gateways, and integrated capabilities. Solution: Through the use of Multitech’s MultiConnect Conduit base station that utilizes LoRa connectivity, Agrint has developed the IoTree solution to enable farmers to increase the efficiency of pesticide management and save trees from damage through early detection/treatment of infestation. Information from the tree sensor is continuously fed into the cloud and updated so that farmers can stay fully aware and eliminate costly replacement expenses. Irrigation automation technology manufacturer WaterBit enables vineyard managers to utilize the right amount of water on their vines at the right times, which has a tremendous impact on crop quality. With WaterBit’s microblock granularity, quality and yield can be monitored across a field with variable soil and weather conditions through a small unit placed under the foliage. Solution: WaterBit‘s autonomous irrigation solution allows farmers to save hundreds of labor hours, improve crop quality, and increase yield. Technology manufacturer Afimilk offers dairy management sensors and software solutions that utilize RFID tags and Bluetooth RFID wand and cellular connectivity that sends data through the cloud. Its offerings are proving highly effective for managing dairy herds. Dairy profitability depends on herd fertility, which is based on optimized lactation intervals. In maintaining good fertility, the main factor is timing. Afimilk has determined that, by identifying the exact time for breeding, it will lead to better pregnancy rates. Solution: With the Afimilk Silent Herdsman smart neck sensor and fertility management system software, farmers are making more money and saving time by wirelessly monitoring cows in real time. Alerts are sent for optimal fertility times and changes associated with the onset of heat, the health of the animal, and its eating habits. Data retrieved from the smart collar is stored in the cloud for review and analysis at any time from anywhere, allowing farmers to make informed decisions on their herds around the clock. How often does the end user need to gather data? With so many different sensors and connectivity options plus application and network management platforms, there is now so much data that can be collected. But this doesn’t mean that the more data packets a sensor can send, the better it is. Less than 20% of all IoT data collected is being analyzed and used. The key to managing this data is in understanding the desired outcome and analyzing the data to make informed decisions. Understand the challenge/problem you are trying to solve. Identify the data points from the field that are required to solve the challenge. Identify the hardware required to collate such data. Identify the software solution required to analyze and process the data. Understand how often the data is required to be collected. Determine the type of connectivity needed to send and receive the data. Select connectivity option(s) and potential IoT provider(s). The future of precision agriculture is in collecting and analyzing the data from sensors easily and inexpensively to maximize efficiency on the farms while increasing yield and productivity. This “stuff” is still hard and complicated. We, as an industry, need to educate the farmers, vendors, resellers, and dealers so that the right decisions on products and services are made. With the use of the right solution suite, end users can extract value from their technology investments and continue to grow their businesses. IoT sensors and everything that is in the farming application will continue to move the industry forward, but someone needs to pull all of this together. We need agriculture IoT systems integrators who will be fully responsible for all aspects of the deployment and ongoing technical and customer support. They need to understand IoT software, IoT hardware (sensors and communication products), IoT networks, security, installation, and data management. This is a critical piece for the farmer, and it is not prevalent today. As these systems integrators become more prevalent, the explosion of smart agriculture will take hold. 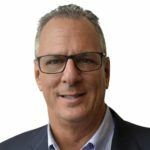 Steve Brumer leads the IoT Practice at 151 Advisors, an IoT consultancy firm based in New York that provides companies across all industries with real-world go-to-market strategy and execution services. See all author stories here.